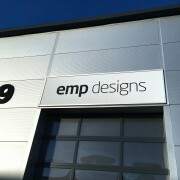 EMP Designs was first set up when a film company came to our founder Dan Stanton and asked for some help with a bespoke electronics project. 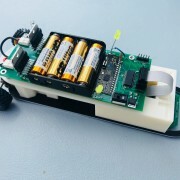 Dan has always loved an electronics challenge, so he set to solving it! Once complete, more requests came in and Dan set up EMP. This year the company is 15 years old and although we’ve diversified into many other areas and sectors, our film and TV work is still going strong and we’re proud to work with some of the industry’s finest. We’d love to shout about all our projects, but many of them are confidential and we have to keep our enthusiasm to ourselves. 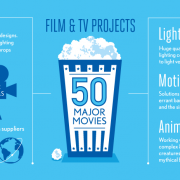 However, we’ve created an infographic for our Projects webpage to give an overview of our work in this industry across lighting, motion and animatronics. To see the full details go to Projects. 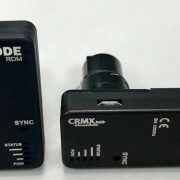 Working regularly with film makers, we created a micro radio DMX pixel controller for use on set. At only 12mm wide, it is exactly the same width as LED strip, allowing the controller to be completely hidden away, ideal for use on lead active props. It receives the full DMX universe, enabling control of every individual LED on addressable RGBW strip and the creation of any colour or pattern. 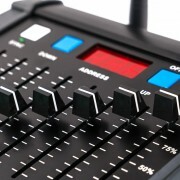 More controllers can be added to address more than the full DMX 512 channels. This device has been popular already being used to illuminate many movie weapons. 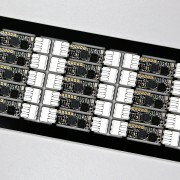 We also developed a recordable version of the radio DMX pixel controller. This allows a pre-defined light pattern to be programmed in and run back on a repeating loop via 2 playback buttons to minimise background pattern channel usage. In line with this technology, our customers have also requested many bespoke custom single circuit board contained units, which have the LEDs on one side of the circuit board and the control electronics on the back, and sometimes the battery too!!. These have been used to produce a range of other lighting effects on film props, including lanterns, flickering candles and glowing fireplace embers. Look out for our new 12mm wide five channel 5M strip controller coming soon! Following the success of our standard radio desk transmitter which provides easy and portable control of 8 channels, we have been asked to develop a desk with the same features but more channels. Introducing the 40 way desk…. 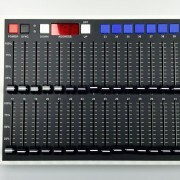 There 32 sliders, and 8 flash buttons delivering 40 channels. 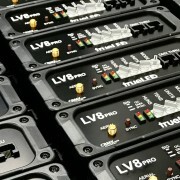 Each slider provides a channel of easy access and real-time control. In collaboration with Cinelex, our developers have created new software that will drastically change the capabilities of our Radio Desk from 8 active channels to a full DMX universe. Our 8 channel desk was designed as a simple, compact, portable unit to provide instant access to 8 easy channels of control. It is a highly popular item in the film and TV industry and is used around the world. However, speaking to users, we had requests for more complex functionality to allow the same unit to be used to set up more complicated and detailed lighting scenes, which would normally require a much larger desk. With the new software, Pages mode allows every-single address to be assigned as an active channel. Users can move through the 512 DMX channels in pages. Each Page represents 8 channels, with 64 Pages in total. The new pages can be saved and edited as part of an ‘Intelligent Memory’ system. This ensures parameter states are retained, meaning a light will remain continually active and set, even when controlling fixtures across multiple Pages. In addition, all fixture settings remain constant until the applicable fader is activated, avoiding sudden jumps when Pages are changed. 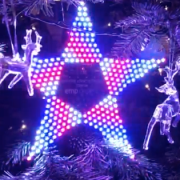 With some complex LED lights requiring multiple channels to control one head, this software extends the capability to control significantly more lights and larger scenes. At EMP Designs, we take great pride in talking to our clients and product users and ensuring that we deliver the best technology and solutions. We are always seeking to evolve and develop to meet new requirements. Users often know what they want, but don’t understand how it might work and what the problems might be. We listen, then design, develop and test as quickly and responsively as possible to deliver high functioning, quality products. All DESK-TX8 from January 2018 will include the new features as standard, at no extra cost. We are delighted to have worked with Cinelex on this project. The new desks are available from them now. Our LV4 Pro handheld controller has arrived! 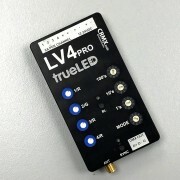 The market leading, 4 channel, RGBW LED controller with embedded Lumen Radio has been made smaller, slimmer and now handles twice as much power as the standard LV4, with up to 8 amps per channel. For more information, click here. Or contact us.